I poked around a bit online and found a bunch of people arguing against the plain reading of the text, and some people making terrible, full-a-holes arguments for the plain reading. Does anybody have anything GOOD? Does anybody have anything GOOD ? Good materials commenting on God’s words here at the end of 1Timothy 2 are exceedingly rare, today. Almost everyone tips their hat to the new revolution which is almost worse than going whole-hog into it because tepid affirmations that stop at the door of the home and church eviscerate these commands from their universal application mandated by God’s creation order of man and woman. I could go on, but complementarians will elicit howls of indignation from male and female rebels alike, and complementarians are horrible. So, as always, go to dead men from the previous two millenia. They always get it right. PS: Here are some posts that would be helpful. There’s a single mom who is a recent convert in our church, and recently during the ladies bible study, she asked why women couldn’t preach. She was still confused after the study was over, so she and my wife listened to this podcast together, and discussed it, and it was very helpful. 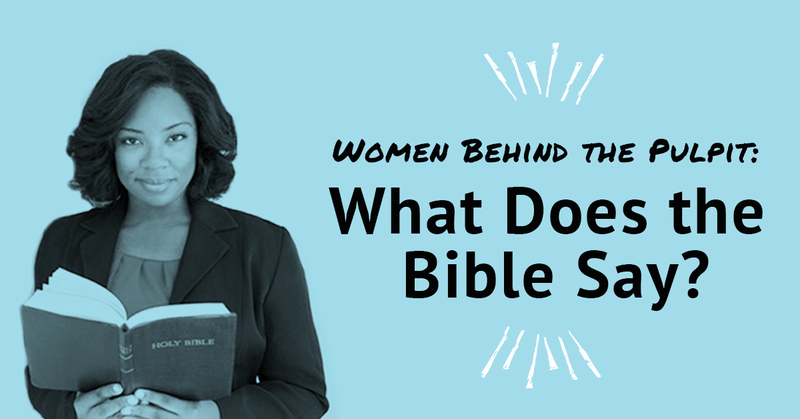 Women Behind the Pulpit: What Does the Bible Say? They also include at the bottom a number of links to more articles, which may be useful to you. Edited to add: I have not read any of the articles recommended by this site, and therefore am not endorsing them, but merely pointing out their existence. Aside from the Valley Girls segment in the first several minutes, isn’t this just basically women preaching though? Good one with the valley girls. isn’t this just basically women preaching though? Only if any and all discussion of scripture and God is preaching. I wouldn’t try and make someone to listen to a podcast like this if their conscience forbade it, but I’m pretty sure women putting out teaching for other women is not forbidden by 1 Timothy 2. What pastors and elders say has authority with their listeners. To say that a podcast, an article, a book, or a conversation is preaching, solely because the content is about God and the Bible, is to cave in principle to the feminist argument that the women who witnessed Jesus’s resurrection were “female preachers” because they told people about it, or that Deborah is a model for female leaders in the church because she was a judge who gave orders on behalf of God to the people of God. Put another way, your suggestion carries no water with me. I appreciate the pushback as this is still something I’m grappling with. What bothers me about it is that they are expounding scripture, which seems to be plainly and exactly what 1 Timothy 2 is forbidding. I was glad to see that some of those links got not one thumbs-up. And we’ve had some feisty convos on the topic in that group. Most of the ladies are likeminded, but we want the others there, too, so they are in the Word and being shaped by it. So what sort of quietness does Paul have in mind? It’s the kind of quietness that respects and honors the leadership of the men God has called to oversee the church. Verse 11 says that the quietness is “in all submissiveness,” and verse 12 says the quietness is the opposite of “authority over men,” and so the point is not whether a woman says nothing, but whether she is submissive and whether she supports the authority of the men God has called to oversee the church. Quietness means not speaking in a way that compromises that authority. Rather, what Scripture seems to consistently say is that it is inappropriate and wrong for women to teach men, or hold positions of authority over them(elder for example) based on the order of creation and God’s design of the sexes. However, women can and should teach those who are under their authority (i.e. children), as well as their peers(other women). This is similar to what 1 Timothy says about authority. Women have authority in their sphere, which is why children should obey them as well as their fathers, but it is limited to their God ordained sphere. I understand the same to be true with teaching. It is limited to their God ordained sphere. Since I have the chance, let me also express how much I appreciated your article on gravitas at Its Good to Be a Man. It gave me a lot to think on, and some to repent of. Thank you for it. Hey Jesse, you’re welcome. We have another article on that topic under development. It has been something I myself have had to work through as well. If you look at Titus 2, the older women are to teach what is good, and so train the young women to love their husbands and children, to be self-controlled, pure, working at home, kind, and submissive to their own husbands. None of this requires the kind of public exposition of Scripture that women today are very comfortable doing. I also don’t think the age of the women can be discounted; these are women who have a proven track record of practicing what they are teaching the younger women. This doesn’t seem to look much at all like Sheologians (for example). There’s also something that makes me uneasy about the platform here. Titus 2 women are those who engage in personal counsel with the younger women. It is a motherly role. How motherly can something like a podcast or a book or a conference be? How personal can anonymous counsel be? There seems to be a big mismatch here; they’re not doing the same thing, performing the same role, filling the same need. ISTM that it’s the most motherly thing in the world to be talking Bible all day long – interpreting the world for her children or for younger women through the lens of all of Scripture. Ideally, she will be doing this under other authorities (husband, church) whose oversight will be aware of and deal with any error. Dad should have a really good grasp on what Mom is teaching the kids, and a wise man will want a wife who knows her way around the Bible and who can be trusted to answer those thousand questions a day that Junior throws at her. And to go back to the original example, the Sheologians podcast is a ministry of Apologia Church, if they were to say something unorthodox, it would most likely be caught before the episode got uploaded. I don’t believe the Titus 2 list of topics is exhaustive, but even if it were, is there any part of Scripture that is not necessary to a woman’s full understanding and practice of marriage, mothering, and personal holiness? And if we did take it at its very narrowest, surely the one part of Scripture a Titus 2 woman ought to, indeed must be able to exegete up, down, and sideways is…Titus 2! Wasn’t Timothy taught by his mother, Eunice and his grandmother, Lois? At least it is inferred here. It seems that the sincere faith was handed down to him maternally. And King Lemuel, in Proverbs 31:1 was taught by his mother. Also, at least twice in Proverbs, the son is told not to forsake the teaching of his mother. If women are forbidden to teach at all then these instances would be contradicting this command. I think your reading of Titus is wooden and rigid. A godly woman who loves God’s word is truly a blessing and enhancement to her husband in the training up of their children. When she is teaching her children and younger women to love God and obey his word isn’t this a huge help to her husband? And isn’t she fulfilling her role as a ‘helpmeet’? This, coupled with her example of respect and submission toward her husband, will go a long way toward training her children in the way they should go. Phew, yes, I was so relieved to see that no one liked any of those links! Especially the Junia Project one- yikes. The thing about Piper is that Paul says “it’s shameful for a woman to speak in church”. Piper is leaving an enormous loophole for rebellious women to hop through. As I write this, the thought occurs to me that maybe I’m taking for granted that the phrase “over a man” is a limiting phrase of both “teaching” and “exercising authority.” I suppose a relevant question would be whether that is Paul’s intention. Is he saying “I do not permit a woman to teach [a man] or to exercise authority over a man,” or is he saying, “I do not permit a woman to teach [at all] or to exercise authority over a man.” ? If the latter is what Paul meant, then “teach” here must be something different that “teach” in Titus 2:3. My understanding is that Paul is prohibiting women from teaching men, not from teaching anyone at all. But the next question would be what counts as teaching men? Does putting out a podcast count as this type of teaching? What about writing books for a general audience? Are all public expositions of scripture and statement about theology the type of teaching Paul is addressing in 1 Tim 2? Does it matter whether the intended audience is women, men, or the general public? In a different context, these questions might come up as an attempt at reductio ad absurdum, but that’s not at all my intention. I’m asking sincerely. Pastor Bayly, I agree with what you said, so let me try to clarify what I believe. First, location is irrelevant to what 1 Tim. 2 says. It doesn’t matter whether it is the church, home, or a California beach, Paul’s teaching applies. When some people try to argue that women should not preach in a church, but can teach pastors in a seminary, that is a ludicrous arguement, and impossible to hold with any consistency. The same would be true for any permutation of that sort of argument. Second, when Paul says teach in 1Timothy 2, he is making an application of a creational principle, from how God created the world and men and women. I believe he is referring to what could be called biblical teaching or biblical instruction. In other words, it is teaching with a certain type of content. I don’t think he is saying women should never teach anything about the Bible, but that they shouldn’t teach it to men. They could teach children, for example, without violating what 1 Timothy 2 says. Third, since this is an application from a creational principle, it isn’t limited to this, and many other applications should be made from the order of creation. Thanks for the continued interaction. I’ll try give my thoughts on the various points you raised. I agree insofar as there should always be oversight over people who teaching. When in the past I have taught Adult Sunday School at my church, it was under the oversight of my pastor and fellow elders. When my pastor preaches and teaches weekly, it is under the oversight of his co-elders, and in many forms of church government, under a presbytery or something similar. The children’s Sunday School classes at my church, taught by both men and women, are under the oversight of the pastor and elders. In addition, if any member of the congregation has a concern over any of teaching happening at any level, they can bring them up, providing another level accountability, if not actual oversight. Mothers teaching their children should get oversight from their husbands. Oversight is always necessary. If you look at Titus 2, the older women are to teach what is good, and so train the young women to love their husbands and children, to be self-controlled, pure, working at home, kind, and submissive to their own husbands. None of this requires the kind of public exposition of Scripture that women today are very comfortable doing. I agree, and often much is done simply by example. However, it would probably require private explanation of Scripture, which you seem to rule out as well. You are certainly correct that many people, men and women, don’t think twice about the propriety of who gives public exposition, many women are comfortable teaching men. There’s also something that makes me uneasy about the platform here. Titus 2 women are those who engage in personal counsel with the younger women. This can certainly be a problem. It’s a problem when celebrity pastors push their internet “ministry” at the expense of their flock, and it’s a problem when women neglect their homes, families, and other responsibilities to spend their time online making Facebook corrections of those they think are wrong. It will always require discernment in those reading ot listening to online material, that it doesn’t take the place of real teachers and authorities in their life, who actually know them and their situations. It also requires discernment on those putting out those materials, to ensure that the motives are good, and they are not sacrificing personal relationships that should be getting their time. It seems to me that our real disagreement is that you seem to think 1 Timothy 2 rules out any teaching by women, no matter the circumstance or recipient. If you’re right, what do you do with the biblical examples provided by @MrsFyootch, or with commands to both parents to train their children? Precisely. @bnonn you need to take this into account in your thinking. The scriptural requirement of Old and New Testaments is clear that children are to honor both father and mother, as well as obey, learn from, and listen to both. The clear corollary is that mothers are to teach their children, not just fathers. Is it possible for her to subvert her husband through this? Of course. Likewise, it is possible for older women to subvert the leaders in a church as they fulfill the command to teach the younger women. The care and protection of children is not a responsibility removed from the man and given straight to the woman. In the church it is the same. The men in leadership are not relieved of the responsibility of the care and protection of the women just because the older women are to do part of the work. In fact, we see that clearly in the text. The instruction (and responsibility) is given to Timothy to see that the younger women are being taught the right stuff. By whom? The older women, at least in part. The pastor and elders that don’t know what their wives are reading or whether it is poisonous are in a bad way. Or if they don’t know what the women’s study is discussing, etc. I think a better framing is, “What are women in the home/church/world instructed to do?” If we focus on the clear commands and instructions of Scripture, like what Titus 2 women are actually told to teach right in the passage, I think that the question of something like a women’s ministry exegetical podcast comes a lot more clearly into focus. It seems to me that our real disagreement is that you seem to think 1 Timothy 2 rules out any teaching by women, no matter the circumstance or recipient. I think your reading of Titus is wooden and rigid. A godly woman who loves God’s word is truly a blessing and enhancement to her husband in the training up of their children. When she is teaching her children and younger women to love God and obey his word isn’t this a huge help to her husband? The application here is in the context of the church and her teaching and government, but to limit the principle to the church, even if we added the Christian home, is contrary to the plain meaning of the text. This is the central error of the church’s doctrine of sexuality today. Agreed. That said, obviously it would be strange for a woman to never be allowed to teach a man anything; it’s hard to imagine, for instance, that Paul intended this principle to be so broad that a Christian midwife could not teach a group of soon-to-be-fathers about how to prepare for being a support to their wives during childbirth! This is why, in the past, I have distinguished between teaching per se and teaching, as it were, in God’s stead. The latter would include things like expositing Scripture, declaring the law, and so on. But this distinction isn’t as handy as I originally thought, because obviously a mother (under which I would include a Titus 2 woman; not all motherhood is biological) is to teach her children in God’s stead—presumably provided she is doing so under authority (whether her husband’s or her pastor’s). Having reflected on this, I think the key problem is in trying to abstract the principle away from the fundamental natural bonds in which it inheres. As you have observed, the key is the creation order. A mother teaches her children. A father teaches his children. What constitutes a mother or father and their children can be broad, and can even include anonymity in the sense that a ruler of a nation does not know most of his own citizens. But there is still a natural relation between him and them on account of the way God has set up nations to function. Mass media seems to have introduced a very strange and non-natural relationship (not wishing to prejudice us against it as contrary to nature, necessarily), wherein men and women can do things naturally reserved to fathers and mothers, without having any normal fatherly or motherly relationship to those they are ministering to.